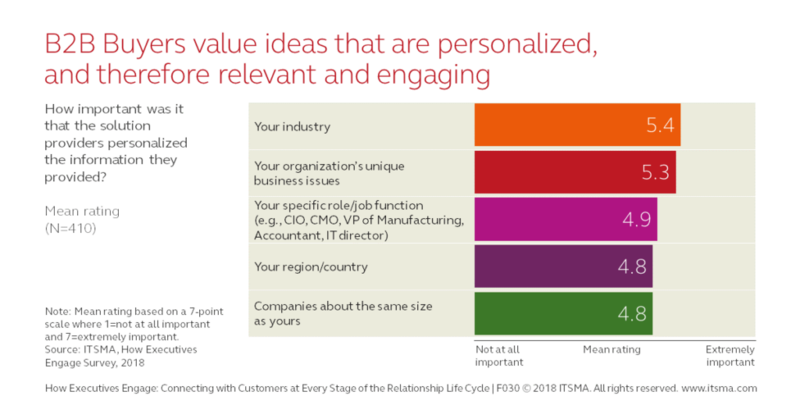 B2B buyers place greater value on ideas that are personalized because they are more relevant and engaging. Therefore, marketers need to continue down the personalization path. We asked about the importance of solutions providers personalizing their content via different dimensions. 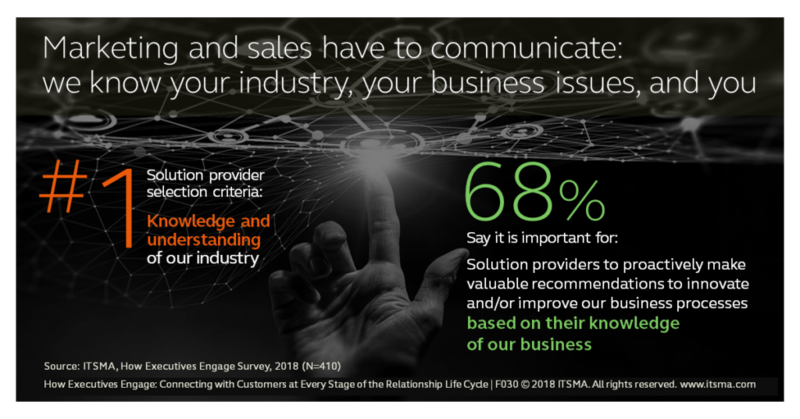 The most important ways buyers want to see information personalized is by industry and their own unique business issues. To a lesser extent, they also want to see personalization based on their role, geographic location, and size of company. Additional data from the ITSMA study corroborates these findings. Knowledge and understanding of the buyers’ industry is the #1 solution provider selection criterion. And 68% of the study respondents say it is important for solution providers to proactively make recommendations for improvements and innovations based on their knowledge of the client’s business. There has been a lot written about personalization in consumer marketing. All the best case studies come from B2C companies such as Amazon, Netflix, and ThirdLove. We at ITSMA think it is time to shine the light on B2B. We want to know how the best-practice B2B services and solution providers are personalizing their marketing. What’s working and where are the challenges? You can help us answer these questions by taking the 2019 B2B Marketing Personalization Survey. The survey will enable you to contribute to this valuable industry research on personalization in B2B. To thank you for your time (approximately 8 minutes), we will send you a copy of the report containing valuable insights about how you and your peers are using personalization to market to B2B enterprises. We will keep all your responses confidential, reporting only in aggregate. The deadline for the survey is Wednesday, April 3, 2019. We appreciate your valuable input!